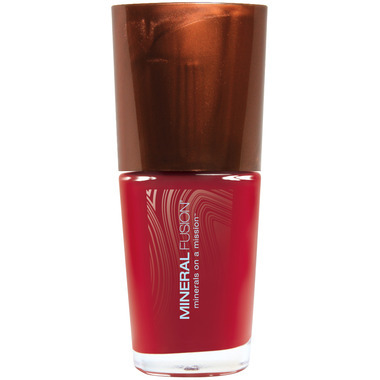 Mineral Fusion Nail Polish is a healthier alternative to traditional nail polish in many gorgeous shades. Apply this long-lasting chip-resistant mineral nail polish formula flawlessly using the custom, extra-thick brush. Mineral Fusion Nail Polish is a toulene free nail polish and like all of their cosmetics, upholds their standard for Formula Purity. Ingredients: Ethyl Acetate, Butyl Acetate, Isopropyl Alcohol, Nitrocellulose, Adipic Acid/Neopentyl Glycol/Trimellitic, Anhydride Copolymer, Trimethyl Pentanyl Diisobutyrate, Stearalkonium Hectorite, Diacetone Alcohol Styrene, Acrylates Copolymer, Silica, Citric Acid, Benzophenone. Mica, Oxides, Titanium Dioxide, Bismuth Oxychloride, Aluminum Powder, D&C Red No. 7 Calcium Lake, D&C Violet No. 2, FD&C Yellow No. 5 Alluminum Lake, Ferric Ammonium Ferrocyanide. Mineral Fusion Nail Polish is formaldehyde free, toulene free, camphor free, dibutyl pthalate free, paraben free, hypoallergenic, gluten free, talc free, fragrance free and free of artificial colors. As with all of their cosmetics, Mineral Fusion Nail Polish is never tested on animals. This is my favourite less toxic polish. It can last a long time with a top coat, especially on toes. Really itâ€™s not much less long-wearing than OPI. Worth trying! Itâ€™s all I use. Love the colors and doesn't peel off like other natural nail polishes. It doesn't last a real long time but it's still very nice if you don't mind re-doing your nails every couple days. Cons: Smells strong, smell lingers after application. I hope to find a nail polish that goes on as nicely that doesn't offend my olfactory senses. I've used this nail polish several times now and it's great. The color goes on really nicely and it dries fairly quickly. I like that it's an affordable price. It chips at the same rate as more expensive polish on my nails so to me the quality is comparable. I would definitely recommend it. Quite like this polish -I got the blushing crystal -the coat has lasted already for the week. I wanted a clear shine and if you put it on thinly it does that -thicker and there is a white / pinkish cast to it. Love the colour! It was exactly what I thought it would be. It did chip on the 3rd day, so the second time I use it I did a sparkling top coat and it did last 9 days. Love that it's natural. Love the color. Don't like the quality. It doesn't last very long. In fact, it shipped the next day. I keep my nails very short and they still chipped at the top. Disappointed.. will be trying other brands on Well for natural nail polish. I like that it's a more natural nail polish; however, it does chip and flake off. I keep my nails very short and it still chipped off around the edges within a day. The formula is very watery, and if you don't wipe the excess off the brush it will go all over your fingers. You have to use a tiny amount and slowly work it on your nail for best results. It still chipped for me though. I only have luck with shellac!! I love this nail polish, and happy with the clearance price! It seems to last really well. Still has that nail polish odor though, and the "Coal Mine" color is really washed out and doesn't go on black. The rest of the colors I ordered were perfect and exactly what I wanted--different pinks were great, and the "Obsidian" black color was great and not washed out at all. I bought this nail polish and applied it 2 weeks ago and it still looks great! I love that the ingredients are natural and I highly recommend this product! Great nail polish - I ordered Tahitian Pearl and it went on nicely and stayed on well. I ordered this mainly because it says it's formaldehyde, toulene, camphor and dibutyl pthalate free. The only reason I give this 4 instead of 5 stars is I was disappointed it still had that chemical stink you get with most other nail polishes. I love this nail polish. I abuse my nails on a keyboard all day which leads to tons of chippage in nail polish. This polish stays chip-free for almost 5 days when used with the base coat and top coat. I got an nice coverage with two coats. very beautiful nail polish, opaque in 2 coat, easy application & dries quickly! last long like 3 days without chipping!